The defending champ St. Albert Slash are back along with plenty of returning players. The rest of the field features impressive teams, but none with Esso Cup experience. In the nine-year history of the Esso Cup, Ontario clubs have won three times, including in 2015 and 2016. Brampton is looking to be the next. They won three straight one-goal games in the Ontario play-ins to earn their spot so they can get in done in high-pressure situations. The Canadettes are led by two impressive college commits in Nicole Mackinnon (Guelph) and Kristina Bahl (Maine). Mackinnon had 24 points in 37 games to lead the Canadettes. Hosting the Esso Cup is Metro Boston Pizza, based out of Bridgewater. Metro finished third in their division, going 13-7-4. They were two spots below the Northern Selects who won the Atlantic spot for the Esso Cup. Ellen Laurence is the driving force for the team, having averaged better than one goal per game and two points a game in the season. She’ll be a player to watch. The Northern Selects don’t have to travel far for the Esso Cup as they’ll stay in the home province and head down from northern Nova Scotia. After a dominating 18-0-2-3 season, the Selects went 4-0 through the Atlantic Regional round robin stage, blowing by teams on the way. In the final, the Selects beat the Northern Lightning 7-1. Six players averaged at least a point-per-game and had double digit goal totals. Northern knows it can play with Atlantic teams, but how will they fare against new competition? No Atlantic team or host has medaled at the Esso Cup. Out of the West, the Saskatoon Stars are looking like a favourite in the tournament. At their regional play-in, the handedly took down Eastman after sweeping both of their playoff series in Saskatchewan. In the regular season, the Stars were 21-3-3-1 with a +111 goal differential. They were led by MacKenna Parker, Anna Leschyshyn and Grace Shirley, first, second and third, respectively, in league scoring. These three are so lethal, other teams will need a strong game plan to shut them down. Last year’s defending champions are back to defend their title. After the second best record in their league, St. Albert beat Greater Vancouver 2-1 in the Pacific play-in and have plenty of returnees. 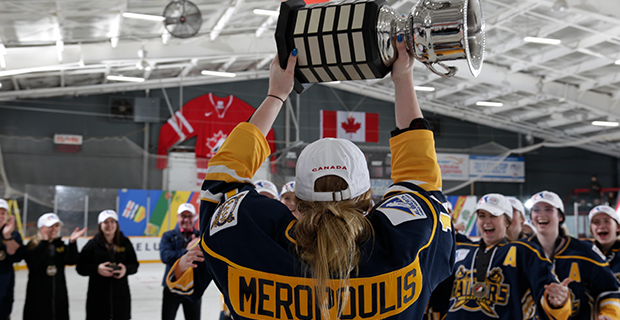 Tyra Meropoulis scored the championship clinching goal in last year’s 1-0 OT win at the Esso and she’ll be back, available to play hero once more. Camryn Drever, who had a shutout in the win, is also between the pipes for the Slash one final time before she heads to the University of Saskatchewan next year. For the past two years, the Quebec champion has finished second at the Esso Cup, so this year the Pionnières de Lanaudière will be looking to bring gold to La Belle Province for the first time since 2013. The Pionnieres went undefeated through the Dodge Cup playoffs, getting by with a 2-1 win in the final. A Quebec news article said the team had started the year with a goal of a .500 record, so they went above and beyond big time. Notable alumni in past male Midget National Championships include Sidney Crosby (2002), Steve Yzerman (1980), Jordan Eberle (2006), Al MacInnis (1977), Patrick Roy (1982) and Ron Francis (1980). The Esso Cup has seen Olympian Brigette Lacquette (2009) and CWHL forward Brittany Esposito.